I wrote a feature on my ScrollBoss site about various things that irk me about video games based on comic books. 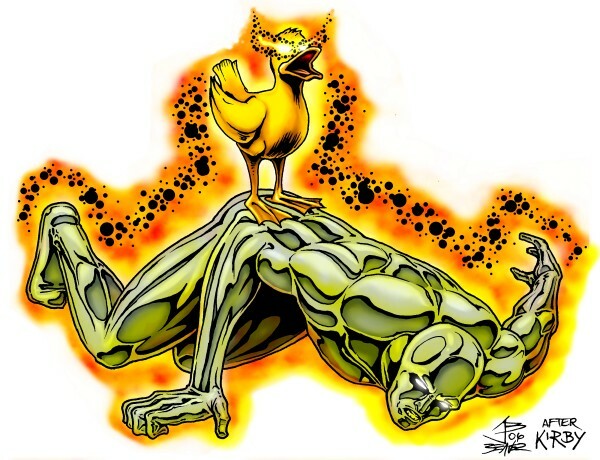 One of the things that I mentioned was from the Silver Surfer game for the Nintendo Entertainment System where the Silver Surfer could be killed by colliding with a duck. Let that sink in for a moment. A character who could withstand punches from the Hulk and the Thing can be killed by a duck. This picture celebrates the absurdity of that. To be fair, the gameplay itself isn't bad at all and has some of the best music you'll hear on the NES. The Surfer's pose is based on a Jack Kirby Fantastic Four panel where Doctor Doom steals the power cosmic from the Silver Surfer.